I’m back after being out of circulation for a couple of weeks. We had a wonderful (albeit a little hot and insanely hectic) time in India and before we knew it, an entire month had gone by in the blink of an eye! Since our return, lethargy coupled with zero motivation has been making it hard for me to post anything at all. I have been busy in the kitchen though. A few days back, I made a molagootal following a recipe that I first came across on a blog a few years back, and it has since become one of my favorites. Sadly though, the blog has been silent for too long now. I did not make too many changes to the original recipe. Heat oil in a small pan and roast the urad dal, red chillies and cumin seeds. Grind to a fine paste with the coconut. 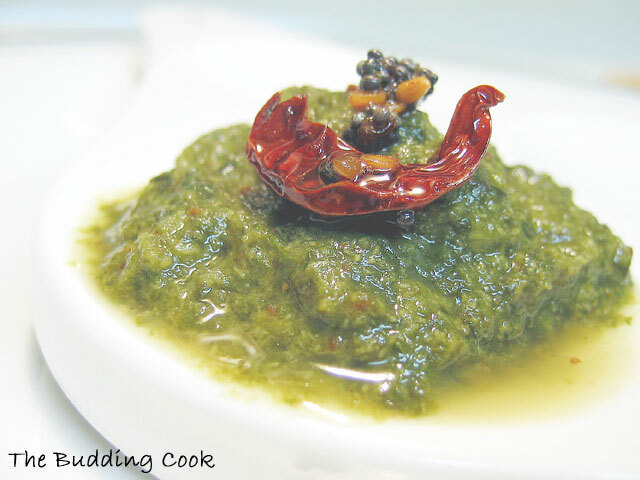 Combine the spinach puree/paste, ground coconut-spice mixture and the cooked dal. Add a little bit of water. Cook and bring to a boil. Heat the rest of the oil in the pan. Add all the ingredients for the seasoning. Pour the tempered oil over the molagootal. This is being sent to Sra who is hosting the fourth edition of My Legume Love Affair. Comfort food..Glad you had a graet time in India..looking forward to our India trip..
Hey.. look who is back posting recipes again. So good to have you back and that spinach milagootal looks so pretty. I love saffron hut too - beautiful picturs and yummy recipes. Yipee...glad to have u back....never heard of spinach moolagootal (quite the tongue twister). That makes for one nutritious spinach recipe (we usually make something similar but instead of toor dal, use besan as a base). I am going to be posting different spinach recipes soon. How time flies when we are on a vacation! Welcome back, awesome recipe! This sounds so different for me. Nice recipe. Looks so good. YUM! Welcome back- India trip is always hectic and flies away so quickly. I too use the same method for keerai molakootal, loved the photos with the seasoning. Welcome back. I'm sure you had a fabulous vacation. We have a variety of molagootal all the time but I never thought of turning spinach into one. looks interesting. Doesn't it taste too bland? Welcome back! Great recipe. I've never heard of Moolagootal before. Where's it from? You have a great collection of recipes yourself... especially digging the raspberry brownie cups! They are delightful. Sukanya & Shreya- hope you get a chance to try it out. Aparna- yeah, we had a great time. Molagootal is a dish commonly prepared by Iyers from the Palakkad region of Kerala. Welcome back TBC :) Tell us more about your india trip! Hi TBC, yes, this will qualify. Please send me the info. Weclome back!!! I have never used frozen spinach before but that looks yummy! welcome back..time home flies faster than here. this molagootal is getting popular on the blogs..
Yum yum yum. Anything with spinach is welcome, and especially something so gorgeous as this molagootal. Welcome back, TBC. I've missed you! Looks good and do let us more about the trip . I'm not too fond of spinach but this dish was good. It has to be spiced up or else it could turn out to be really bland.